Manage every aspect of the experiences you provide, from scheduling to pricing to inventory management to guide assignment to customer communication, and more all within Xola. Xola’s intuitive software makes setting up and managing tours and activities a breeze. Set up your tours in minutes. Create as many custom schedules and pricing variations as your business requires in just a few clicks. Define blackout dates and cut-off times for booking one, some, or all of your offerings, and view and adapt reservations directly from the dashboard. Xola provides operators with a complete business software suite, enabling bookings from every channel, payment processing, marketing initiatives, customer management, front-desk optimization, tour analytics, and much more. Powerful scheduling and pricing options to meet the most complex demands. 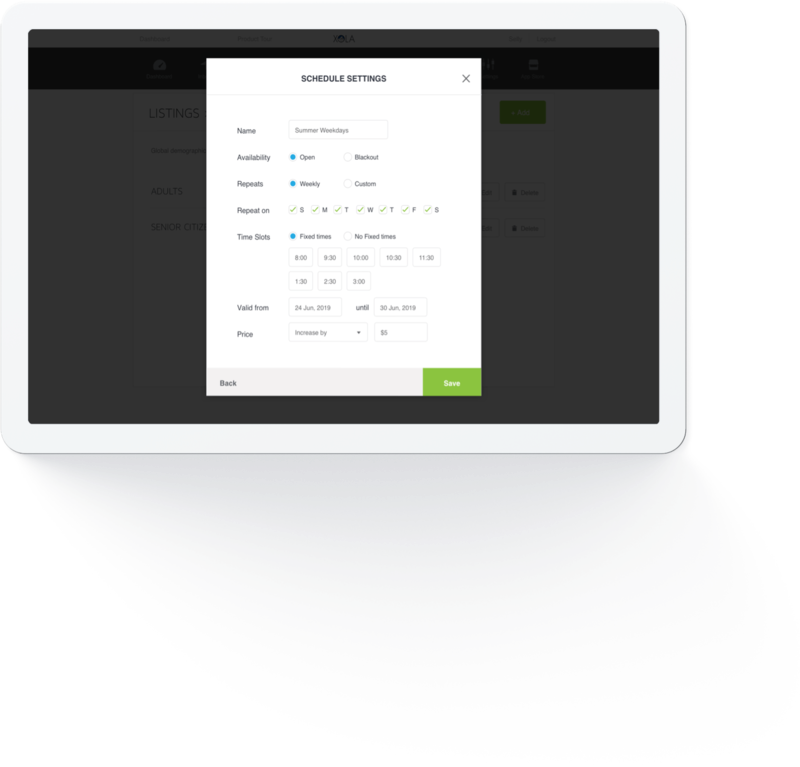 Setting up your offerings, schedules, and pricing variations is a breeze with Xola. Input your global preferences and requirements once — including blackout dates, terms of service, required customer information, and more — and they will automatically apply to all of your offerings saving you time. Easily override these global settings to customize a specific offering in just a few clicks. Set up as many custom schedules as you need per offering in minutes. If your rates change by season, day of week, or even time of day you can update your schedule or create a new one in just a few clicks. 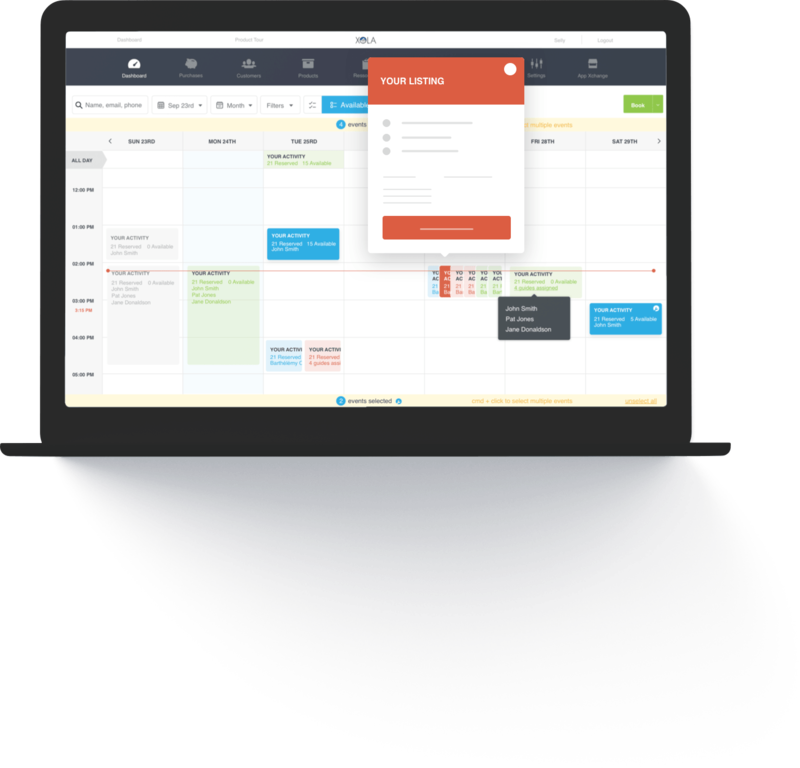 Easily set expectations to your usual schedule, such as blacking out dates for certain offerings, defining cut-off times for customers attempting to booking one, some, or all of your tours, much more. Choose from a variety of pricing options per tour. Easily set up as many pricing variations as you need per tour and customize them to your heart's content. Set up varied rates by customer types, decide whether on not to provide discounts to groups of various sizes and at what rate, and easily offer customers down payments, online payments, and on-site payment options. Easily set minimum and maximum capacities per outing or reservation, and determine how much time before the activity is scheduled it can be booked. Xola will automatically notify guests if the minimum required per outing isn’t reached, won’t let you overbook if you hit the maximum capacity, and will stop accepting bookings once the cut-off time for the time slot has passed. Easily bundle offerings into an activity package. Simply pick two or more offerings to create an activity package based on the schedules, prices, and restrictions of each offering. And easily set up package restrictions when necessary, including custom blackout dates, required minimum duration between packaged activities, start time restrictions, and more. freeing you to focus on your guests. Set up your tours, pricing variations, and schedules in minutes. Create as many custom schedules and pricing variations as your business requires in just a few clicks. Define blackout dates and cut-off times for booking one, some, or all of your offerings, and view and adapt reservations directly from your dashboard. Instantly see what you have planned for the day, week, month, or more with Xola’s advanced calendar views. 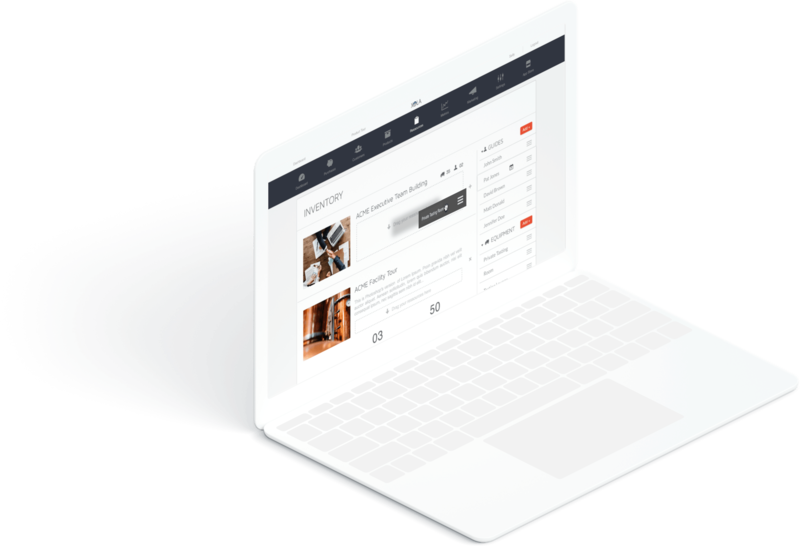 Select one of the pre-built views, including filters by reservations, availability, activity, and time slot, or create and save your own custom views to match your specific business needs. Assign guides, view orders, make a booking, and take additional action all from one place. Easily collect the information you need to run your tours without fear of decreasing conversion rates. Ask customers custom questions, from age to allergies, with Xola’s post-purchase questionnaires. Easily share customer answers with guides to keep them in the know. Assign essential equipment to activities and let Xola manage your inventory based on the number of people that have reserved each offering. Easily set minimum and maximum capacity thresholds and equipment counts and let Xola do the rest. You’ll never have to worry about accepting reservations you cannot fulfil. Easily assign tour staff to outings and share information with them automatically with Xola. Set up guide schedules, share trip rosters and customer information with assigned guides, and keep them in the know with calendar sync options and email notifications. Assign guides with 1 click from the dashboard and get instantly notified if no guide is assigned to a booked outing. Share relevant information and secure the rest with Xola’s role-based information access. 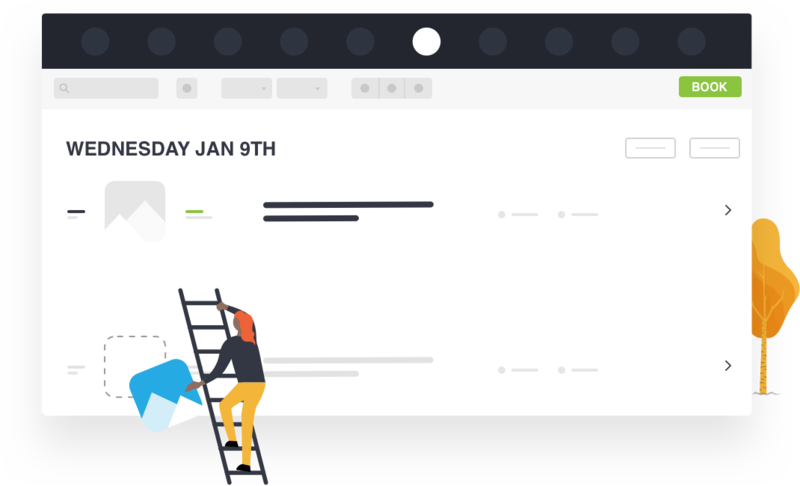 With eight different types of users accounts, there’s an access level for every role, including guides, reservationists, accountants, admins, and more. Every booking modification is tied to the user that performed it, so you are never left guessing who did what.